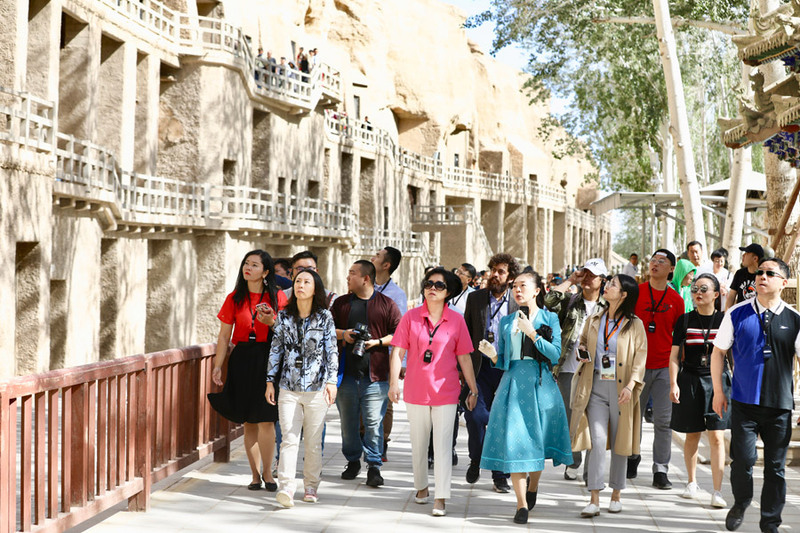 Tourists will be able to reach Dunhuang, Gansu province, directly by high-speed train soon and see its famous Mogao Grottoes among other sites, after a high-speed train reached the city during a test run on Wednesday. On Wednesday morning, a test bullet train from Jiayuguan, Gansu, arrived at Dunhuang rail station, marking the city's first connectivity to the high-speed rail network, Dunhuang authorities said on the city's official social media account. "Dunhuang only has a 160-kilometer regular railway connecting with other cities in Gansu so people can only get there now by ordinary train," said an official at the Lanzhou Railway Bureau's publicity office, who declined to be named. "The 3-kilometer railway construction was finished. It will connect the regular railway to the Lanzhou-Xinjiang high-speed line, the only one in northwest Gansu, so that bullet trains can arrive in Dunhuang." The official said the test train will be fully checked to ensure it can run along the whole journey safely. "Although the high-speed train's running speed hasn't been decided upon, it's certain that the commuting time of tourists heading to Dunhuang will be reduced," he said. Now, there are only three direct regular trains from Lanzhou to Dunhuang per day, and the journey takes over 12 hours. "What's more important, Dunhuang will be incorporated into the national high-speed railway network, so that visitors from major cities in other parts of China - including Xi'an, Beijing, Shanghai and Wuhan - can reach Dunhuang much faster than ever before," he said. Dunhuang was a major stop on the ancient Silk Road and is best known for the nearby Mogao Grottoes, a UNESCO World Heritage Site containing some of the finest examples of Buddhist art. According to the Dunhuang tourism administration, over 9 million people visited Dunhuang in 2017, up 12.3 percent year-on-year. Wang Weiang, 23, visited Gansu last year. She took the bullet train from Beijing to Lanzhou and then traveled to the Mogao Grottoes, by bus. "It's quite painful to sit on a bus for over seven hours a day," she said. "I really want to visit the Mogao Grottoes one more time. It would great to get there by bullet train." Chen Jinye, director of the administration, also believes less commuting time will attract more visitors from major cities and benefit local tourism development.